Early this year we found out we were expecting baby number 5. It was a huge suprise as I found out when I was 14 weeks along!! From the moment I found out I was pregnant I knew I wanted to home birth, I had wanted to with my last baby but my husband wigged out on me so I didn't pursue the idea. This time I didn't give him a choice! 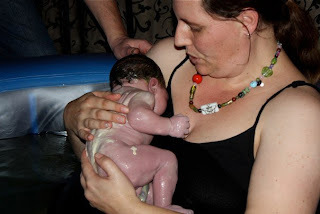 It was a bit of a stress trying to find an independent midwife and the funding ( we has to get a new motor for our 7 seater car before this bub was born) and it was up in the air right as to whether I would get my home birth or not right up to to end. After a horrible appointment at the hospital I came home and told my husband it man up because I wasn't going back to that hospital and I would birth this baby at home with or without him!! It was then he realised how much this meant to me and took the time to research and realised that having a baby at home ins't such a scary thing. 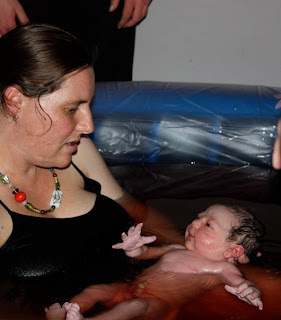 I found myself an awesome Doula and started preparing for my home waterbirth. It was so exciting I actually found myself wanting and looking foward to going into labour. My due date (Sunday the 2nd of July) came and went (not that I took much notice of that, after all they are just an estimated due date) but I knew bub would come when ready. I was just enjoying what I knew would be last few days/weeks of being pregnant. I woke early Thursday morning feeling a little crampy, kind of like very mild period pain. At first I didn’t really think much of it as it was so mild and I hadn’t had my show, which is how all my previous labours, had started. I spent a few hours lazing on the couch watching TV with the kids getting a cramp every half-hour to 40 minutes. Finally at around 12 o’clock I had a small amount of show, yet I still wasn’t convinced so kept it to myself. I thought I might try getting up and getting busy with housework to try get things moving along. I cleaned, cooked a zucchini slice and did some washing. At around 3pm the cramps had become more regular, around 20 minutes apart. But because they were so very mild I still wasn’t convinced it was labour. I continued to keep myself busy cleaning the house and organising my birth space just in case. Between 3pm and 4pm I was loosing more show each time I went to the toilet was finally convinced that this was the start of labour and that maybe late tonight/early tomorrow morning I would be having a baby. I informed hubby on what was happening and then messaged my Doula to let her know. I spent another hour getting the stuff for the birth out and organised when I released I hadn’t sewn up the sling for weighing bub. So I went and did that and then got tea for the kids and put them to bed. I jumped on facebook at 6.30 to let two of my good friends know I thought I’d be having bub tonight. I rang my Doula at 8pm. We had a chat and decided she would make her way her as soon as her hubby got home. Even though my contractions had picked up a little they were still mildish but coming around every 10 minutes now. I text my friend who was coming to take photos to let her know things were happening and to come over when she was ready. Hubby moved the dinning table and we started setting up the birth pool, my contractions picked up then and I started to have to stop and sway through them, they were coming around every 7 minutes now. I started thinking we might not get the pool filled in time so got my eldest daughter to get a bucket water into the pool from the laundry tap. At around 10pm my Doula arrived, I was in the kitchen swaying and breathing through a contraction. I still felt like I had hours left because even though contractions where coming every 5 minutes they weren’t really strong or painful. I had another contraction and decided I wanted to get in the pool, but changed my mine. I was worried if I got in to soon it would slow down. My friend arrived at 10.15 and I decided I wanted in the pool. It felt so good in the pool. Within in minutes a really strong contraction hit, I had to really breathe through that one, while my doula patted my down with a cool cloth. After I sat back watching my belly move laughing with my friend. It was about 2 minutes and bang the next contraction hit, even more painful (but bearable) than the last. After that one I joked about wanting an epi which made me think I was hitting transition. Weighing 8 pound exactly, 47 cm long.